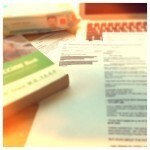 As a #NewsMom, you’d better bet I bought the book and even took classes on Alternative Vaccine Schedules. I wanted to be as educated as possible about every option and risk. Apparently, I’m not alone. A new study by The American Academy of Pediatrics found that, while most doctors try to talk parents out of it, they agree to let parents alter the CDC’s recommended vaccination schedule. Let’s be clear: this is not about skipping vaccines. This is not about personal belief exemptions that allow parents to avoid vaccinations altogether for school-aged kids. This study (and blog) is about the decision to spread out the recommended vaccines for children under the age of 2. What is an Alternative Vaccination Schedule? In short, instead of getting five vaccinations all at once every two to three months (as recommend by the CDC), parents split up the vaccinations so babies get one or two shots every month. In most cases, the children are totally up-to-date with their vaccinations by the time they come back for their next scheduled visit. 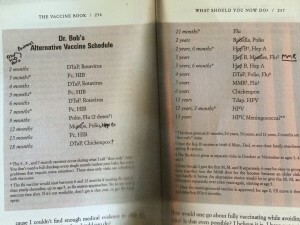 Most blame/praise the Dr. Sears “Vaccine Book” for the increasing trend. For years it was the bible of alternative vaccination schedules. As you can imagine, it is controversial. NOTE: While the alternative schedule only delays most vaccinations by two to three months, it does push back the MMR (measles) vaccine from 1 year to 3 years of age. Obviously, that has been getting A LOT of criticism in light of the recent measles “outbreak.” Many parents follow the schedule loosely, but get the entire course of MMR at 12 months—as recommend by the CDC. Google “Dr. Sears Measles” for both sides of that particular debate. The MMR issue was not the focus of the AAP study. Most doctors said they were asked to spread out the recommended vaccine schedule. 93 percent of doctors reported that parents asked them to delay vaccines in any given month. 1 in 5 doctors said more than 10 percent of parents asked for an alternative schedule. Most doctors said they are against administering alternative (or split) vaccinations schedules. 87 percent of doctors said they believe delaying vaccines puts the kids at risk of getting preventable diseases. 84 percent believe it is ultimately more painful for children to bring them back for separate injections. Anecdotally, doctors and experts I’ve consulted say the CDC schedule is intended to get kids fully vaccinated with the least amount of effort for parents. One of the greatest concerns is that parents won’t come back to complete the vaccinations. Still, many doctors reported that they gave in and allowed parents to split their vaccinations. Few refused (2 percent “often/always,” 4 percent “sometimes”). Doctors said they spend a lot of time dealing with alternative schedules—and they don’t like it. AAP doctors said counseling concerned parents about vaccines can take 10 to 14 minutes longer (more than half the average visit). As a result, they’re spending less time counseling on other important topics—like safe sleep or toilet training. 40 percent of doctors said it has decreased their overall job satisfaction. Wow. Boy do I feel bad! I hope my pediatrician is not among that last 40 percent. 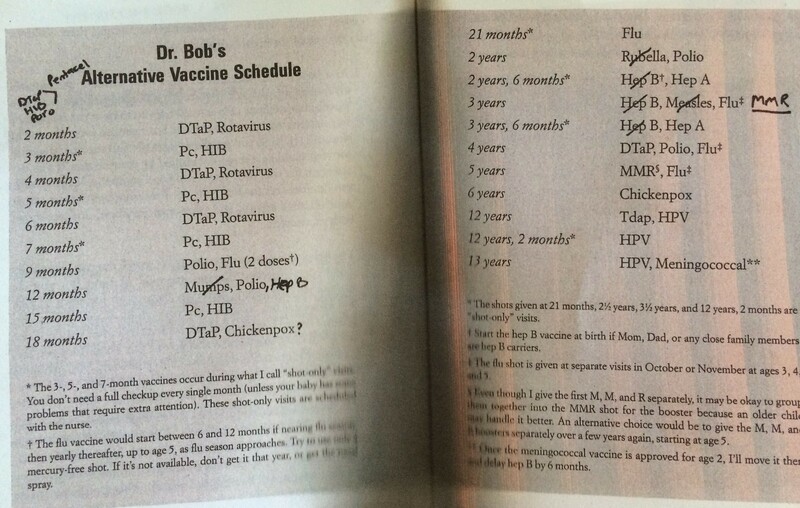 The alternative vaccination schedule is a pretty common topic among mommy circles in the Bay Area. I’d venture to guess far more than 10 percent of parents here ask for (or about) alternative vaccination schedules. After reading the book and taking the classes, I decided to go with the alternate schedule for Baby C. However, I acknowledge that more information is not always a good thing. It can make you paranoid (says the mom whose day job exposes her to far too many stories about fluke accidents, scams and hidden dangers)! Dr. Sears says because you’re giving your baby just one live viral vaccine at a time, your baby’s body has more time to adjust and better handle possible side effects. If by some fluke your baby has a reaction, it’s easier to determine exactly which vaccine the baby is reacting to. And then there is the unscientific feeling in your gut that you are going above and beyond as a parent to protect your child from some “potential” unknown danger. Even Doctor Sears says there is no medical evidence that this precaution is necessary or even useful. More shots = more pain. Because many of the vaccines on the recommended CDC schedule are combined into one shot, if you split them up, your baby will ultimately get more individual shots. Your baby may be exposed to one of those preventable diseases in the month that you postpone that particular vaccine. The belief that their child is unlikely to get a vaccine-preventable disease. Concern that their child might develop autism. As a paranoid first-time mom who researched WAY too much for my own good, I ultimately started out on the split schedule. I also followed other unscientific “recommendations,” like applying numbing cream to the injection site before each shot and nursing during the injection (both intended to ease the pain). I swear the staff at my pediatrician’s office rolled their eyes every time I walked in the door, but they supported my requests… and as a result I kept coming back, and I kept my kid vaccinated. 82 percent believed if they agreed to the requests, it would build trust with families. 80 percent also believed that if they did not agree, families might leave their practice. Doctors reported that they tried a variety of strategies to change parents’ minds, but did not think they were effective. Reluctantly, I gave in and let him give her all her vaccinations that day. As luck would have it, she got her first bad cold the very next day. The two were likely unrelated, but I cried and blamed myself. Now, at 20 months old, Baby C is totally up to date (and yes, we got her MMR at 12 months as recommended by the CDC—primarily because we live in San Francisco and we travel a lot). In hindsight, would I do the alternative schedule again? Right now—today—I’d say if we have another baby, I would keep to the CDC’s recommended vaccination schedule. But honestly, who knows? I was recently commiserating with a fellow #NewsMom about the head vs. heart debate. As a journalist, your head tells you to listen to the science. As a parent, your gut asks—what if? What if “they” are wrong? What if the science changes tomorrow? Could I live with my decision either way? Alas, she who lives in a glass house shall not throw stones. As a parent I never judge others (and I hope they give me the same respect). Doctors are beginning to kick parents out of their practices for choosing not to vaccinate at all. However, many currently say that if splitting up vaccinations helps to keep kids vaccinated, then they are willing to do it (even if they’d rather not). Featured Blogs & Reviews feed on NewsMom.com.